Date of publication: 10 2015 June . 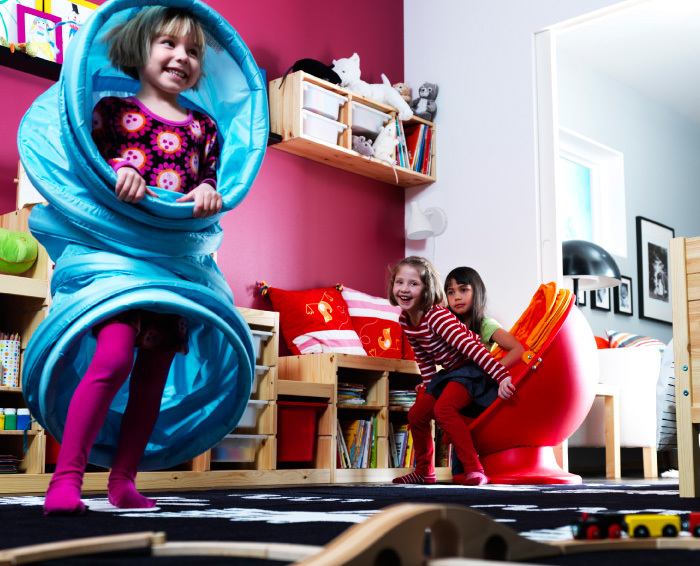 Today we offer you a "wish list" for children's roomIt will be the most amazing and creative things created by designers IKEA. We, however, do not pretend that the selected products will be approved for all you 100%, and even in our opinion, it's not all that can be placed in this category. Follow our i-Top, and probably soon, we will continue this theme, but in a different way. Bed-loft - is furniture, the main part of which is a sleeper. In addition, in such furniture has storage compartments, a drawer, where you can do the lessons. Considering that the bed is on the "second floor" STUVA not recommended for children under school age. What do we get by buying this wonderful invention? Bed, desk, storage space and, of course, more space in the nursery. Scattered toys ... designer items, which are already seemingly impossible to find in abundance that we constantly acquire fun to our children ... Familiar? furniture Series Storage named TROFAST specially designed to toys or baby things could be sorted into several compartments / containers that will prevent the room from the disorder, and parents - the trouble. Furthermore, if you place the containers at a convenient height for the child, he would be happy to lay out and get their own clothes and toys. Caring for containers and combination TROFAST easy, clean, dry cloth. DUKTIG perfect for kids who are just starting to explore the world, and for those who may have already come up with themed games, imitating adults. For safety reasons, the manufacturer recommends use of this series of products with 3 years. The set consists of all kinds of basic foods that children meet in real life: sausage, cheese, pasta, pepper, fish, eggplant, bread. A big plus of these toys - they can be washed in the washing machine, but in the delicate washing at 40 degrees. 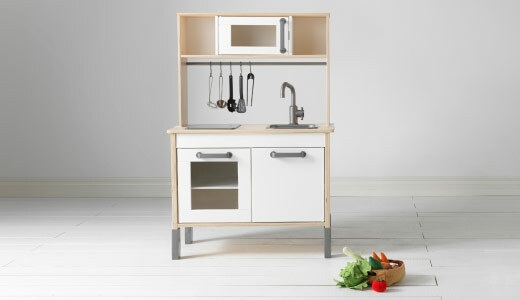 DUKTIG - toy is not only products, but also kid's KitchenThat fully replicates adult. Hob, microwave, cooking utensils - what is there just no! As the "cherry on the cake" in our i-Top - collection children's textilesWithout which it is certainly not possible to make the children's room to perfection. In the development of textile collections for children's rooms were not only IKEA designers, but also as experts, the children were invited. 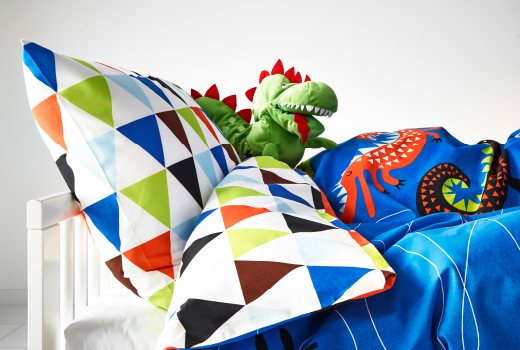 Among the most famous IKEA textile collections - VENNERNA, UTFORSKA, ONSKEDROM, SUDDIG, Vliegen, SILKIG. It is allowed to make textiles more targeted to different age groups. Carpets, bedding, blankets, pillows, curtains ... all this has been created taking into account the personality and interests of children. Needless to say how important toys for children. The company IKEA and here "a hand", creating a collection called MULE. It includes eco-friendly toys made of wood: the abacus, a maze, pyramid, puzzle, set with pegs and a hammer - all it develops logical thinking and motor skills of the child. Target audience - kids from 1,5-3 years and older. "Think of your own life!" The IKEA Holland continues online-project called Design Your Own Life ( «Think of your own life").